Charles was born in the Town of Westerly, Kings Co., R.I. On April 13, 1737 to parents George and Susannah Deake. When his father died the family farm was willed to Charles and his brothers Edward and George. Charles and his brother George may have left for Stonington, Conn. when their mother moved in Nov. 28, 1748 or to live with their sister Thankful or Susannah, both of whom lived in the Town of Stonington, Conn. While living in Conn. Charles learned the tailors trade. 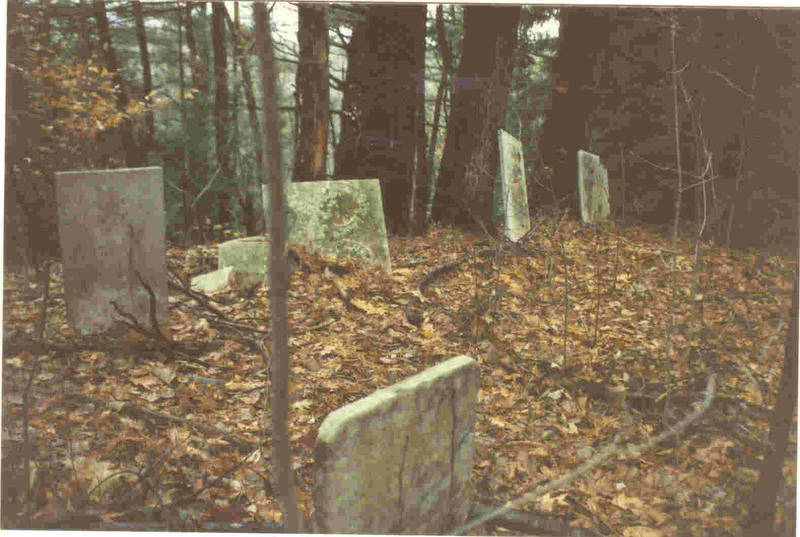 On May 30, 1757, eleven years after his fathers death, a division of the land to the three boys was recorded in the Hopkinton Town records (He was living in Charlestown, R.I. at the time). His brother George sold his portion of their fathers land and John's portion, which he had purchased earlier, to Charles on Dec. 4, 1759. Eventually the farm came into the possession of Charles. The description of the location of the land was: Tract of land lying in Hopkinton in the County of Kings County and Colony of Rhode Island butted and bounded as follows; beginning at the Southwest Corner at Cyrus Buttons land at a stake and stones and running on John Hoxeys land to a stake and stones at Charles Deakes land then running easterly on said Charles land to a stake and stones at Jacob Halls land then running southerly to a marked tree at Josiah Hills land then running on Josiahs land to a stake and stones then running on Cyrus Buttons land to the stake and stones first mentioned containing twenty one acres & an half more or less. A fine home in a good state of preservation stands on that land today. One tradition indicates Charles built this house originally for his bride in 1760. Other information indicates the home is much older than this (see article on Deake/Dake house in the previous section). 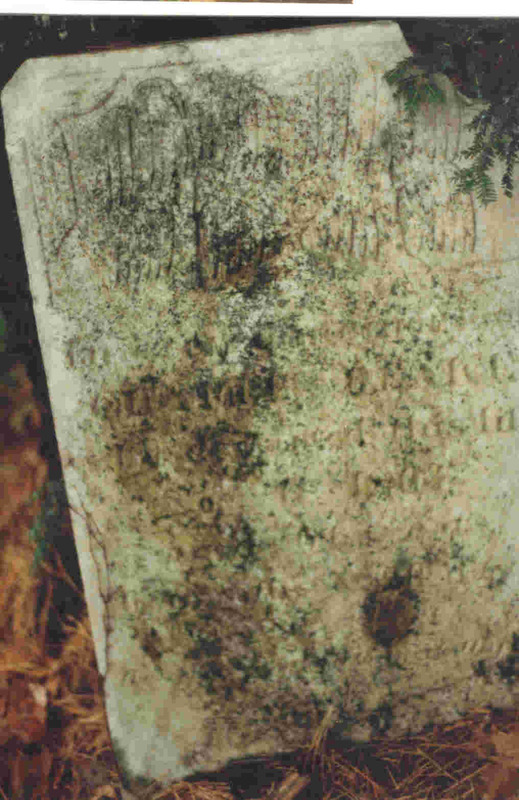 About 1760, he married Anna Gould in Hopkinton, Kings Co., R.I. (parents unknown). She was a native of the Town of Westerly, Kings Co.,R.I. ; having been born there on May 14, 1741. In April 2, 1762 along with several neighbors he donated land two rods wide through their land to start a highway "from highway near Simeon Perry to go by Quaker Meeting to the colony line". In 1766, the property, then described as being on Noose Neck Road, was sold to one Abraham Utter and so passed out of the family. Between 1774 and 1775 Charles and his wife and three sons moved from Hopkinton, Rhode Island to the Valley of the Little White Creek and the Walloonsac River located in what is now White Creek Township, Washington Co., N.Y. Since they were Baptist Church Members, they probably moved with a group of Baptists from R.I. who arrived at about the same time and set up a church in this area organized by Rev. William Waite. A Royal Proclamation, by the King of England, in October, 1763 offered generous terms and encouraged expansion, which may have played a part in their migration, or raids by British troops on farms in this area of Rhode Island may have been their incentive to move. Map of White Creek, Washington Co., NY. With the outbreak of the Revolutionary War, Charles joined the New York Militia, District of Cambridge, County of Albany. (at this time the area was part of Cambridge, Albany Co., N.Y. but currently is part of White Creek, Washington Co., N.Y. The Indian name for the White Creek stream was San Coick) Military records show that he served in Capt. William Brown's Class, Col. John Blair's and Col. Van Woert's Regiments of the New York Militia. (The sixteenth Regiment) The Deakes' lived on a farm adjoining Elder Waites' farm. Elder Waite was the Minister of the White Creek Baptist Church. Their farms were located just north of the Von Schoicks' Mill, located on the western bank of the White Creek where it enters into the Walloonsac River, and on the road between the Village of White Creek and San Coick (now North Hoosick). It was this Mill that Col. Baum of the British Forces used for his headquarters immediately before The Battle of Bennington. It was also down this road that Col. John Williams' Regiment marched from White Creek to North Hoosick and there met and joined another regiment from Bennington, Vt. commanded by Col. Warner and defeated the detachment of British troops sent out to reinforce Col. Baums' Detachment. The following was documented by Sally Dake Gardner on Feb. 1896. "My father's father name was Charles Dake and he was the great-great grandfather of the afore-said applicant. (Carrie O. Dake - D.A.R. Applicant). This Charles Deake, my grandfather, was a Minuteman and fought for American independence under General Stark at The Battle of Bennington, Vermont, on August 16, 1777. He died November 11, 1803, aged sixty four years, six months and twenty days, before I was born. He was survived by his widow Anna Deake, whom I well remember, and from whom I heard and learned the particulars of her husbands participation in The Battle of Bennington. She related them to me when I was a girl. According to her statement at the time of said battle, they resided in the vicinity of Bennington, and on the morning of the day of the battle, my grandfather being with Gen. Starks' Command, she my said grandmother sent their two boys, my father, then fourteen years old, and his older brother William Deake, then about sixteen years old, to a mill with a grist of corn to be ground and as they were returning from the mill, the battle began in their immediate vicinity. When the battle commenced my Uncle William was frightened and began to cry, but my father swung his hat and cheered. From the history of North Hoosick: " In the 1700s a wooden bridge crossed the White Creek, then known by its Indian name SanCoick. The most recent bridge at this A Mr. Van Schaick (referred to as Tory Van Schaick) owned a grist mill powered by the waters of White Creek, at the time of the revolutionary war. The mill was caught up in a skirmish August 14,1777 between a British force led by Colonel Baum and a detachment from the American Army under the command of Colonel Gregg. The British seized the contents of the grist mill and the Americans destroyed the bridge causing Colonel Baum to send for help. The mill that Mr. Van Schaick owned became known as the "Old Grist Mill". During the 1800s it was sold several times. The mill fell into disrepair and had to be rebuilt. John H. Burk, whose father rebuilt the mill, was the last owner. He said that he had all the work he could do supplying feed for the local people. Feed for animals and flour for home use was made from crops of wheat, oats and buckwheat. Common grains grown on the surrounding farms. The Grist Mill burned and was not rebuilt. Along with the grist mill was a sawmill and cider mill, their owners and exact locations have not been recorded. Some of these mills operated into the early 1900s." After the battle my grandmother went to search for my grandfather and found him in a church in Bennington which was then in use as a hospital. 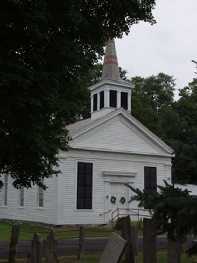 (The church was the old Congregational Church which was a wood building that was replaced in 1804-1806. There is a cemetery next the church which contains the remains of 13 patriots and Hessions who died in the Church/Meeting House as a result of wounds received during the battle). (Another record indicates the church she referred to was the Waite's Meeting House in White Creek and he was wounded with 600 other Hessian prisioners in the small church.) He was not severely wounded but there were three bullet holes through his clothing. She went to bring him some water and as she was carrying it into the church a number of Hessians there begged for the water which she provided to them. Some history books of the area quote her as being the first Red Cross volunteer because of her tending to the wounded. On another occasion during my grandfathers absence, while serving as a Minuteman, a squad of Tories came and got their only cow out of the pasture, and were about to drive her away when grandmother, who was a woman of dignified and noble appearance, went out and confronted them and sternly commanded them to replace the animal in the pasture. The Tories were so impressed by her fearless attitude that they obeyed her order and drove the cow back into the pasture and slunk away. The foregoing statements and incidents were related to me by my said grandmother when I was a girl. She died December 2, 1828, aged 87 years, 6 months and 18 days." Mrs. Gardner later stated "The reason why the said William Gould Deake did begin to cry at the inception of the said Battle of Bennington, and why the said Charles Deake Jr. began to shout were that Charles was too young to fully realize the significance of what was then being enacted, but that his brother William, who was older understood that their father was engaged in the battle." Anna Gould because of her attending to the wounded has been enrolled as a Patriot of The Revolutionary War and in New York history books is listed as the first Red Cross Volunteer. Gen. Stark and the "Green Mountain Boys" defeated the British at The Battle of Bennington. 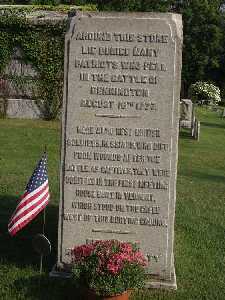 (Battle of Bennington: 2000 U.S. Troups involved with 30 killed and 40 wounded; 916 British Troups with 80 killed and 127 wounded). Pay records for Charles Deake Sr. were recorded as follows: Two pounds, eight shillings and four pence (Certificate 25240) and one pound, seven shillings and nine pence (Certificate 25364) both dated June 1, 1787. Family tradition also indicates he was with General Washington at the surrender of Cornwallis at Yorktown (but this is not proven). From the proceedings of Washington Union Baptist Association, held at Waites Corners, June 1868: "Some of the church members went over to the enemy the night before the battle and were obliged to fight in the conflict of Aug. 16, 1777, against their own brethren and neighbors which threw the church into confusion and entirely broke it up. But the next year Elder Waite collected three members besides himself and began anew." Church records at Waites Corners show Charles Deake, Charles Jr. and Margaret Deake as members in 1784. (Information on Rev. Waite and the White Creek Baptist Church: Rev. 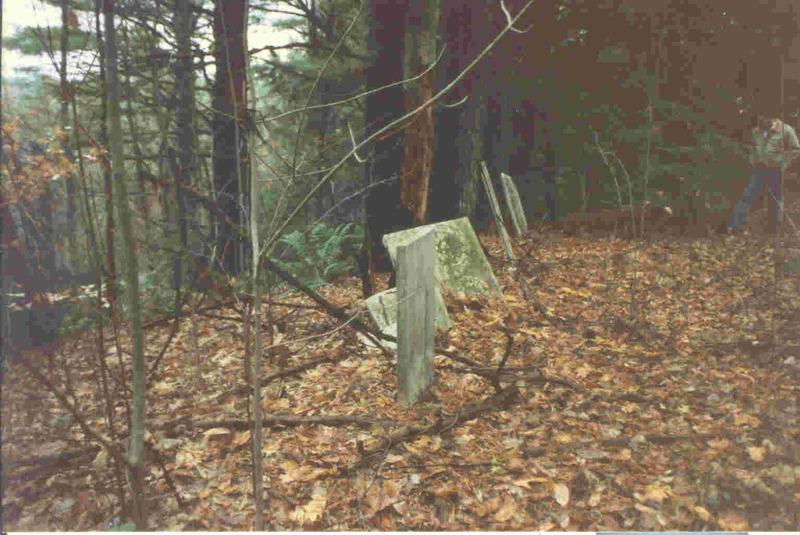 Waite and his wife Mary are buried in the Baptist Church Cemetery in Center White Creek (aka Waite's Corners). The church is just off Rt. 22 south of Cambridge, Washington Co., NY. The cemetery is across the road from the Baptist Church and west of Post Corners.) 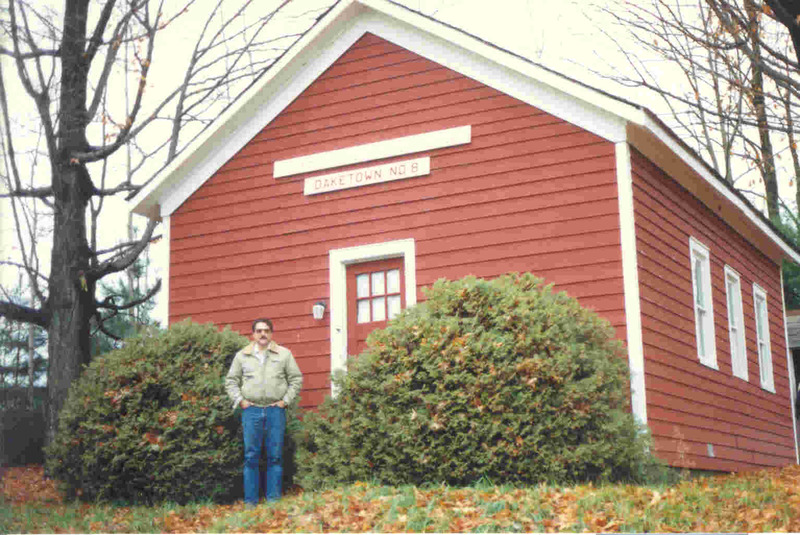 The log church he had built was burned by the British during the "Battle of Bennington" (actually Walloomsac, 4 miles NE of Hoosick Falls in Rensselaer Co., NY, not VT). 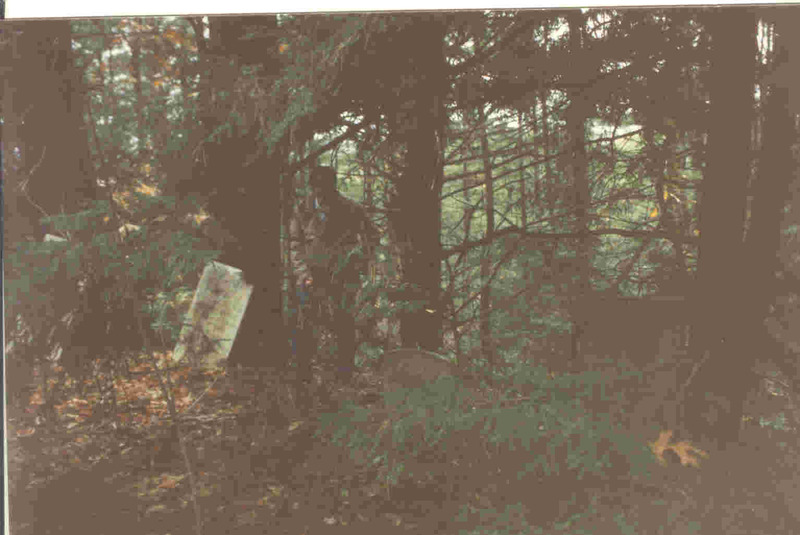 The following historic marker is no longer there: A log church which stood here was burned by the British Battle of Walloomsac, Aug. 16, 1777. It was documented that in the spring of 1786, Charles Sr. his wife and three sons (William Gould Deake, Charles Deake Jr., and Benjamin Deake) moved to the Town of Ballstown, Saratoga Co., N.Y.; however, in the diary of Rev. Samson Occom, a Mohegan Indian minister that Charles knew from Rhode Island, he visited Charles and his family in the Ballston area on October 17, 1785 on his way to Brothertown, NY (this is where Occom moved many of the Indian tribes from the Westerly and Charlestown, RI area), so they probably moved there earlier than indicated. Rev. Occom also mentioned in this book that Charles Deake was a Separate Baptist. Their brother John stayed behind in Washington Co. until some time between 1790 and 1800 and then also moved to Saratoga Co. Recorded in the Saratoga Co. History: "Near the place was a fine large spring of deliciously cool and sparkling water and here were found large quantities of bones of animals showing that some past time it had been used as a camping ground by someone either Indians or Tories probably during the Revolutionary War." On Mar. 7, 1787, Charles Dake "Yeoman" of Albany Co. leased 100 acres of land for one year from Adrain Bancker "Esquire" of Staten Island for five shillings. On Sept. 13, 1787, he purchased the land from Adrain Bancker. The Deakes' were some of the earliest settlers to this part of New York. This area, about a mile and a half northeast of Middle Grove, N.Y., later became known as Daketown. Charles acquired 1500 acres of land in Saratoga Co., N.Y. during his life time. On March 1794, Charles executed a promissory note between Simeon Cosell and Ebenezear Allen for 9 pounds. In 1794 the Second Baptist church of Greenfield was formed at Daketown with Charles Deake Sr. listed as the Church Deacon. (Charles Dake Jr. was also listed as the Deacon when the church was disbanded in 1822. Reverand's. Abel Brown, John Lewis and Timothy Day served this church in the capacity of pastor). To the inhabitants of the vicinity this church was known as the Daketown church and was located about a mile and half northwest of Middle Grove. It was constituted in 1794 and joined the Shaftsbury Association in 1795. It dissolved its connection with that body in 1808 and was finally broken up and disbanded in 1822. 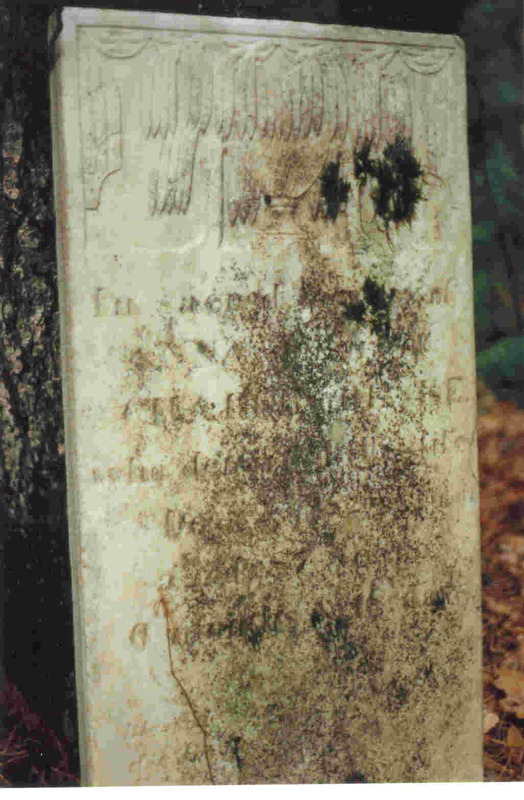 On Nov. 11, 1803 Charles died and was buried in the family cemetery at Daketown. 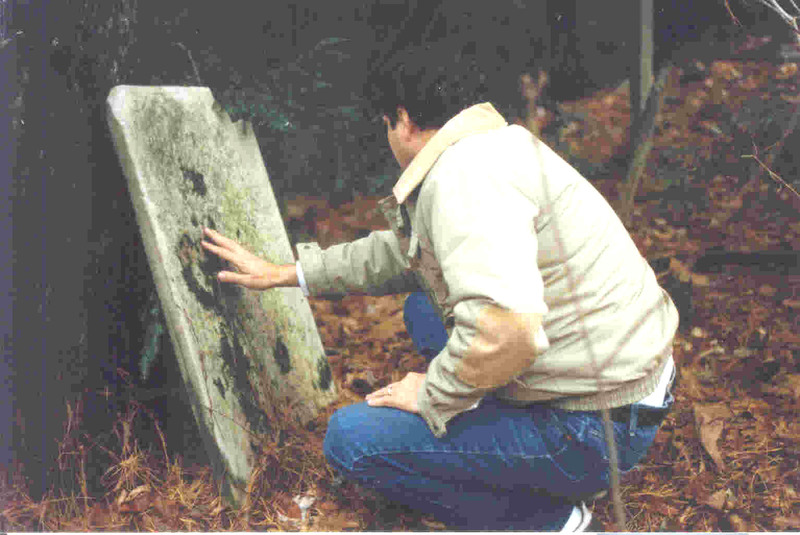 The Dake Cemetery is located near the southwest corner of the junction of the Sand Hill Road and the Kayaderosseras Creek Road (County 19). It is about 250 feet beyond a cabin and over looks the creek road from an elevation of about 100 feet. Recorded on Charles' tombstone is the following inscription. "Charles Deake who departed life Nov. 11, 1803 age 61 years 6 mo. 28 days. ""Reader prepare to meet thy God" The cemetery is located about a half mile from the Charles Deake Sr. home. (In 1811 the family formally changed their name to Dake). Anna continued to live in this area until her death Dec. 2, 1828. She was buried next to her husband in the Dake Cemetery. The inscription on her tombstone reads: "In sacred memory of Anna, consort of Charles Deake, who departed this life Dec. 2, 1828, aged 87 years, 6 months and 18 days. Blessed are the dead that die in the Lord"
Map of Daketown, Greenfield Center, Saratoga Co., NY. BUILT BY CHARLES DEAKE, JR.